From Good Friday to Easter Monday (19th – 22nd April 2019) we will heartily welcome you in Germany’s most beautiful city Hamburg, make you shed some calories on the playing field, celebrate your success with a glamourous award ceremony and gala dinner, go out clubbing afterwards and finish off the weekend with a tasty brunch. Anniversary is here. Already for the 20th time we invite LGBT sport fans from all over Europe to Prague. Every year we make new friends, every year we can't wait to see you. Prague Rainbow Spring is an international sports tournament for LGBT athlets, their friends, colleagues and supporters. Also this time we expect more than 400 participants from many countries to compete in volleyball, badminton, swimming and beachvolleyball. Rome is back indoor! The city of Rome and RoMan Volley will host the “Caput Mundi” “ROMAN EMPIRE MMXIX” edition tournament for the fourth year in a row. “Caput Mundi” is a volleyball tournament dedicated to the LGBT community and friends. The last edition have seen 40 Teams in 5 Level. We are ready to welcome athletes coming from all over Italy and Europe. The tournament will take place between 03-05 May 2019. There is a special promotion for advance registration (first of 15-March-19). We'll close the registration when the level are full. Roma torna indoor. Per il quarto anno consecutivo Roma e la RoMan ospiteranno il Caput Mundi edizione ROMAN EMPIRE MMXIX, torneo di pallavolo dedicato al mondo LGBT e ai loro amici. La Capitale è pronta ad accogliere gli atleti provenienti da tutta Italia e Europa, il torneo si svolgerà dal 03 al 05 Maggio Il torneo è suddiviso in 4 competizioni: A, B+, B-, C.
Prezzo Promo per chi si iscrive entro il 15 marzo 2019. Le iscrizioni chiuderanno al completamento dei livelli. Roma vuelve indoor. 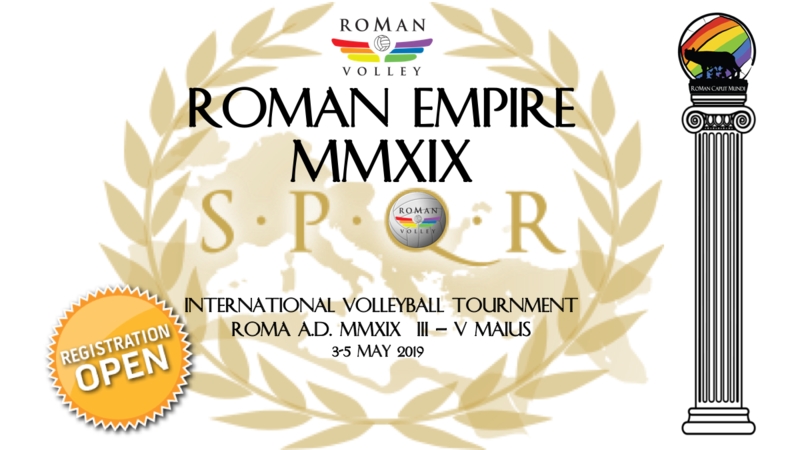 Por quarto año consecutivo la ciudad eterna será la sede de Roma Caput Mundi “ROMAN EMPIRE MMXIX”, torneo de voleibol dedicado a la comunidad LGBT y sus amigos, promovido por RoMan volley. La capital está lista para recibir a los atletas de toda Italia y Europa, el torneo se llevará a cabo desde el 03 hasta el 05 de Majo. Rom kehrt in die Halle zurück. Zum zweiten Mal wird Rom und der Verein RoMan den Caput Mundi veranstalten “ROMAN EMPIRE MMXIX”, das Volleyballturnier für LGBT und ihre Freundinnen und Freunde. Die Hauptstadt ist bereit, Athletinnen und Athleten aus ganz Italien und Europa Willkommen zu heißen. Das Turnier findet vom 03. bis 05. Mai statt. On joue à nouveau en salle, à Rome. Pour la quatrième année consécutive, Rome et l’association RoMan recevront le Caput Mundi “ROMAN EMPIRE”, le tournoi de volley-ball dédié au monde LGTB et à leurs amis. La capitale est prête à accueillir les athlètes venant d’Italie et d’Europe. Le tournoi aura lieu du 03 au 05 May 2019. Prix promotionnel pour ceux qui s'inscrivent avant le 15 mars 2019. L'inscription sera clôturée à la fin des niveaux. 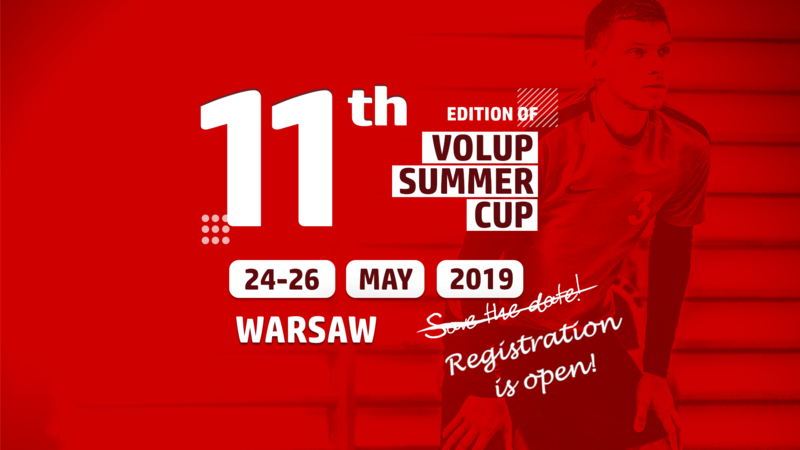 Volup Warsaw is proud to invite you to Volup Summer Cup 2019, the 11th edition of the international LGBT volleyball tournament! Register your team today and enjoy the discount for early birds. For 30€ only you will get a chance to take part in the competition of the highest quality. 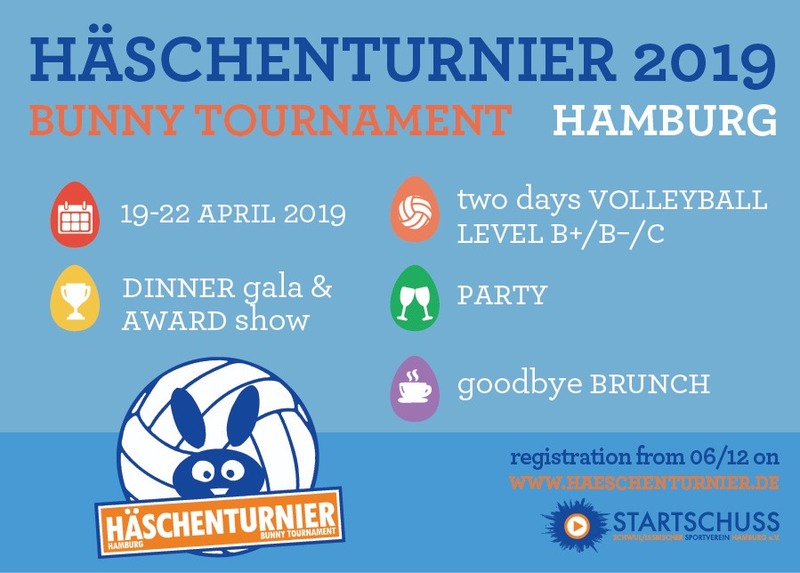 Meals, gifts and entrance for the party after the tournament are included! Attention! The participation fee will rise up to 40€ since March 1st. Summer starts early this year! 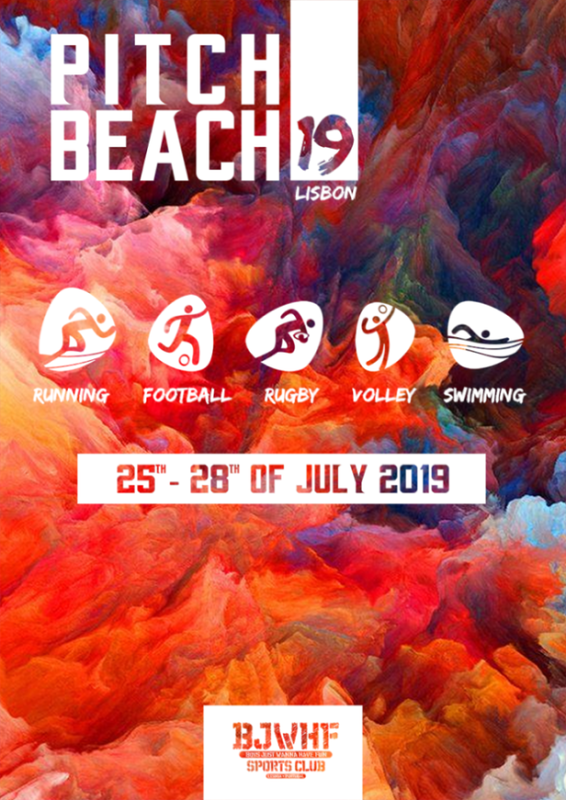 Pitch Beach is an international competition that is held every year in Lisbon since 2010. On the first day we compete on the Pitch, and on the second day we compete on the Beach. Running competitions along with the well known Rugby, Volleyball, Swimming and Football competitions. Join us on this friendly competition, have fun in our social events, and discover why Lisbon is everyone's favorite city. Barbie & Ken Cup: that is the famous Volleyball-Event in Berlin. You can register your team for C, B-minus , or B-plus-Level. We are planning to have 20 teams in total. Depending on the level distribution of registered team, we possibly will split the teams in C, B-, and B+. We encourage B+ teams to participate! Important notice: As we are very interested in applications from foreign teams, we reserve 2 places in each level for teams from abroad until March 31st 2019. In addition, we have an application restriction on Berlin teams: No more than 50% of the participating teams should be from Berlin. If we are booked out, we will have a waiting list. Registration starts Feb 1st 2019! Register online! Fee is moderate and includes a mineral water, coffee, tee, and a yummy buffet all day long on Saturday. In addition: Party with the other teams on a special event. Optional brunch on Sunday. See website for more information. 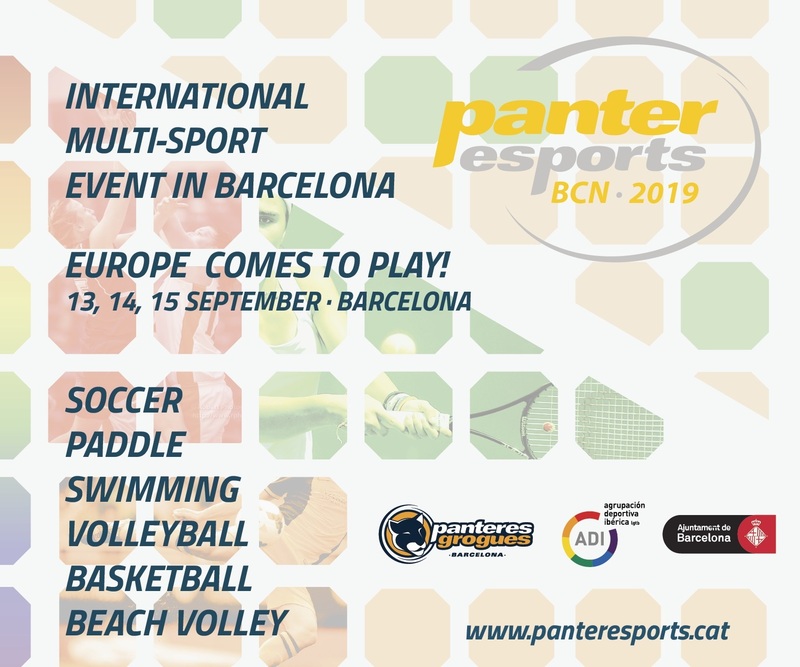 From September 13th to 15th 2019, Panteres Grogues organises Panteresports, an annual multisports event in Barcelona. For 3 days you will be able to enjoy a little bit more of summer practicing sports and enjoying your spare time with more people like you. Soccer, basketball, volleyball, swimming, beach volley and paddle tennis will be the main event sports.